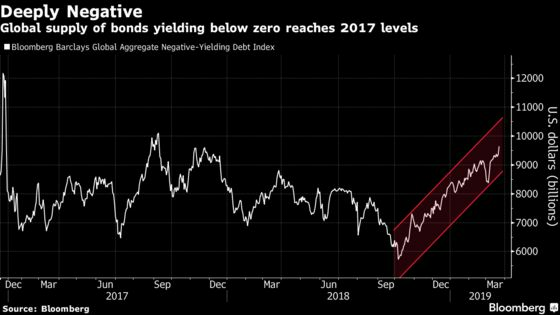 (Bloomberg) -- Brian Tomlinson, a money manager at Allianz Global Investors, has a sticker on his desk that says “Never Short the Bund.” It’s something he says still applies after yields dropped below zero percent for the first time in over two years. While negative yields on paper suggest that investors lose money just by holding German bonds, there are still opportunities for a canny investor to make a buck. U.S. money managers still get a pickup of around 3 percent on a currency-hedged basis, 60 basis points more than holding U.S. 10-year Treasuries. And, should Europe’s economic woes persist, buyers could also be looking at further price gains. For many in the market still dusting themselves off from the financial crisis, that yields have fallen so far this year has come as a surprise. The European Central Bank capped its unprecedented bond-buying program at 2.6 trillion euros in December and had hoped to increase interest rates for the first time since 2011 later this year. Money markets now don’t see the next move until the end of 2020, if at all. Money managers who have said that German yields would rise sharply have been burned in recent years. Hugh Hendry closed his Eclectica hedge fund in 2017 after a wrong-way bet on an increase in Germany’s two-year yield. And in April 2015, bond-market legend Bill Gross described a bet against the 10-year bund as “the short of a lifetime.” His Janus Capital Group Inc. still incurred losses on its Global Unconstrained fund. That has stoked fears that Europe is going the way of Japan: a world of permanently-low interest rates, sluggish inflation and tepid growth outlook. It has forced investors into higher-yielding and riskier securities, such as Italian bonds that were roiled last year amid a budget dispute with the European Union. Political risks too are driving investors to seek harbor in some of the world’s safest assets. The looming threat of U.S. tariffs on European cars is harming German manufacturing, while the prospect of a no-deal Brexit is still firmly on the table. Other benchmark-following investors are simply forced to hold bunds, irrespective of where yields are. The German bond market makes up around 12 percent of the Barclays pan-European index. For those fund managers, the best hope of making a return is to buy longer-dated securities that offer higher yields, according to Russell Silberston, a money manager at Investec Asset Management.